– I claimed to be the first person to adjust a vertebra by hand, using the spinous and transverse processes and levers. I developed the art known as adjusting, and formulated the science of chiropractic, and developed its philosophy. – Life is the expression of tone. In that sentence is the basic principle of Chiropractic. – I feel it my bounden duty to not only replace displaced bones, but also teach others, so that the physical and spiritual may enjoy health, happiness and the full fruition of our earthly lives. 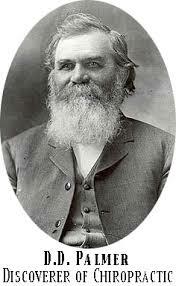 – The basic principle, and the principles of chiropractic which have been developed from it are not new. They are as old as the vertebrae… I am not the first person to replace subluxated vertebra, for this art has been practiced for thousands of years. – I desired to know why one person was ailing and his associate, eating at the same table, working in the same shop, at the same bench was not. Why? What difference was there in these two persons that caused one to have various diseases, while his partner escaped? – To be specific, is to exhibit a knowledge of the principles and art of adjusting; a comprehension of facts so systematized that they are available for the relief of disease. – Chiropractors correct abnormalities of the intellect as well as those of the body. – Many patients imagine that they have tried everything. True, they have used many remedies, but they have never had the cause of their infirmity adjusted. – That which I named ‘innate’ is a segment of that intelligence which fills the universe. – Life is but the expression of spirit through matter. To make life manifest requires the union of spirit and body. – Innate is a segment of the All-Wise; Educated is an offspring of innate, a servant for its lifetime only. Educated continues with and lasts as long as life exists; Innate is eternal, always was and always will be. – Disease is a disturbed condition, not a thing or entity. – Disease is the abnormal performance of certain functions; the abnormal activity has its causes. – The philosophy of chiropractic is founded upon the knowledge of the manner in which a vital functions are performed by innate in health and disease. When the controlling intelligence is able to transmit mental impulses to all parts of the body, free and unobstructed, we have normal action which is health. – Innate directs its vital energy through the nervous system to specialize the coordination and sensation and volition through the cumulative and vegetative functions. – Displacement of any part of the skeletal frame may press against nerves, which are the channels of communication, intensifying or decreasing their carrying capacity, creating either too much or not enough functionating, an aberration known as disease. The nature of the affection depends upon the shape of the bone, the amount of pressure, age of patient, character of nerves impinged upon and the individual makeup. – Pressure on nerves causes irriatation and tension with deranged functions as a result. Why not release the pressure? Why not adjust the cause instead of treating the effects? Why not? 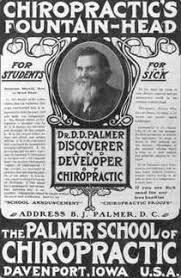 – Do not forget that chiropractors did not treat diseases. They adjust causes, whether acquired, spontaneous, or the result of accident. – Drugs are delusive; they do not adjust anything. – Compulsory vaccination is an outrage and a gross interference with the liberty of the people in a land of freedom. – Chiropractic is a science just so far as it is specific. – The only failure one man should fear, is the failure to do his best. – There is a vast difference between treating effects and adjusting the cause. 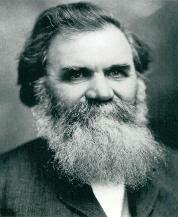 – Chiropractic is founded upon different principles than those of medicine. 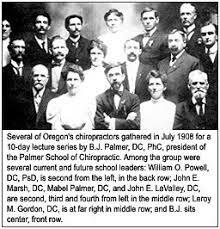 – I laid the foundation and built thereon, the science of CHIROPRACTIC.